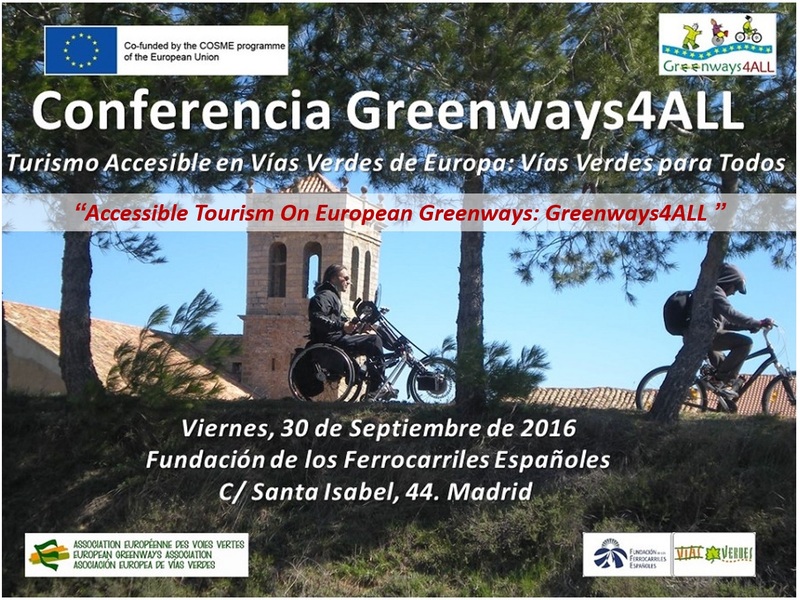 The European Greenways Association and the Spanish Railways Foundation, as project coordinator partner of “Greenways4ALL” project organize on Friday, September 30, the first conference of this European project which began last July 1, 2016. The conference will take place at the FFE headquarters (C / Santa Isabel, 44, Madrid). The conference “Accessible Tourism on European Greenways: Greenways for All” aims to publicize the “Greenways4ALL” project and share experiences on accessible tourism, improving accessibility around greenways and the dissemination of these routes as resources for all. It is aimed at political and technical professionals at national and regional level, county councils, municipalities, greenways managers, experts, entrepreneurs and workers in the tourism sector, the third sector and specialized media. The conference is the starting point of the European project Greenways4ALL with the aim of moving towards a product that meets the value chain of accessibility; from the accessible travel path to an accessible experience. Thus, accessibility is the common element to all resources that integrate the tourism product: walking the greenway, eating in restaurants in the area, lodging in the immediate vicinity to the greenway, visiting museums or doing some shopping, among others options. The project is coordinated by the FFE and there are 8 partners from Spain and Portugal participating, in which EGWA provides the European dimension to the project and coordinates communication. The Project is 75% co-funded by the COSME Programme of the EASME (Executive Agency for Small and Medium-sized Enterprises) of the European Union for the Competitiveness of Enterprises and Small and Medium-sized Enterprises. It has a total budget of €166,148.60 and a completion period of 18 months. Further info and detailed partners HERE!